This 60-page large-format publication of the Homer Society of Natural History was written to accompany the Darkened Waters: Profile of an Oil Spill exhibit, an acclaimed educational exhibit created by the Pratt Museum in Homer, Alaska. A traveling version of the exhibit toured museums throughout the country, including the Smithsonian, for a number of years, and a small version of the exhibit is still on display at the Pratt Museum. Nancy was particularly well-suited to author this publication designed for the general public. At the time of the 1989 Exxon Valdez oil spill, she was working for the Alaska Legislature on resource and budget issues, and her summertime work as a commercial salmon fisherman was directly affected by spill damages. Her intimate knowledge of the spill and its aftermath was matched with her ability and passion for transforming science and public policy issues into clear and unbiased narrative. The publication's goals were to extend beyond the primarily visual exhibitry to address the background of the spill and cleanup events and to explain in “plain English” the sometimes complex science involved. The larger goal of both exhibit and publication was to challenge Americans to consider the costs of our oil dependence and to find ways to reduce risk and better safeguard the ocean’s health. 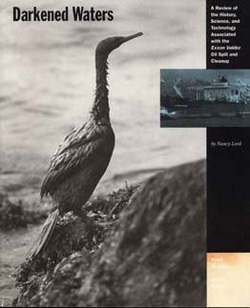 The publication—with chapters on the history of Alaska’s oil development, the effects of oil in the sea and food web, Native subsistence, cleanup technologies, the rescue and rehabilitation of wildlife, recovery and restoration, and more—is well illustrated with photographs, charts, and drawings, and includes suggestions for further reading. Generous support from the National Science Foundation made it possible to price Darkened Waters at an affordable $5 per copy (plus shipping).